A significant number of patients with chronic pain syndromes are in need of physical therapy services. A rehabilitation program is devised based upon the therapist’s initial evaluation. A treatment plan is then designed to meet the patient’s specific goals and the patient is progressed per their treatment protocols. The role of the therapist is to evaluate and manage a program, which is designed to accomplish the goals set by both the patient and their therapist. Based on the patient’s evaluation and objective measurement, the type of treatment may include a muscle strengthening program, a flexibility and general conditioning program, and pain management program. 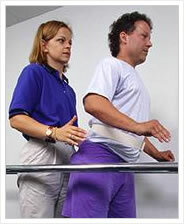 Treatment may include a specific exercise or rehabilitation program and modalities such as moist heat, paraffin, ultrasound, electrical stimulation, iontophoresis, ice, a home exercise program, and “hands on” consisting of myofascial release, soft tissue massage, passive range of motion, and joint mobilization, as needed. The goals of physical therapy depend on the patient’s type and level of activity to which the patient would like to return regarding their particular activities such as golf and tennis. The goals of a patient’s treatment plan is to restore joint function and joint mobility, increase muscle strength, decrease pain and inflammation, improve flexibility, resume normal activities, and return to sports as tolerated. All of these goals can be achieved by working together as a team to help the patient recover from an injury or surgical procedure, helping to pave their road to recovery. Chronic Pain is a complex condition, which can affect multiple aspects of our daily life. The pain experience is not only biological, but also social, emotional and psychological. A licensed psychotherapist can help patients understand and control the link between these emotions and their pain. Certain pain reductions techniques are taught, that can ultimately decrease or eliminate the dependency on medications. We consider the psychological services an essential component in pain medicine. Chiropractic and osteopathic medicine represent another conservative treatment option for patients with low back pain. The overall philosophy for chiropractic and osteopathic manipulations is that joint dysfunction in the lower (lumbar) spine can produce low back pain. Mobilizing the lumbar spine joints though manipulations (commonly referred to as “adjustments”) can decrease low back pain. Chiropractic or osteopathic manipulations can be especially helpful in relieving pain for facet joint injuries, osteoarthritis, and sacroiliac joint dysfunction, as these conditions represent joint dysfunction that responds well to mobilization.